Sen. Garrett Mason, R-Lisbon, at the State House in Augusta in mid-March. 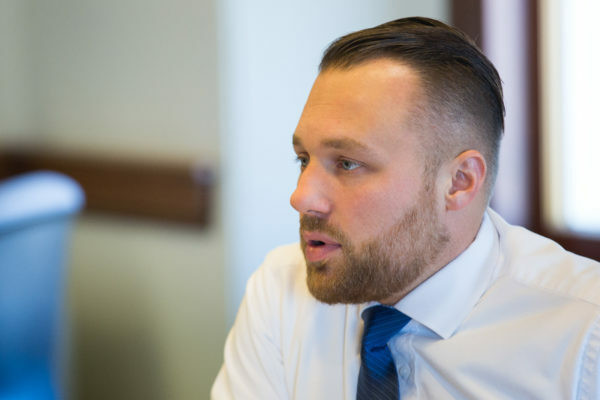 AUGUSTA, Maine — Maine Senate Majority Leader Garrett Mason will announce a run for governor this week, which will make the young conservative with deep ties to the state’s evangelical right the second Republican vying to replace Gov. Paul LePage. Mason, 32, of Lisbon Falls announced late Monday that he’ll declare his run this week. He has publicly considered a run since late last year. In January, there were references to a run inserted as metadata on his website. The four-term state senator joins former Maine Health and Human Services Commissioner Mary Mayhew of South China in the Republican field running for the Blaine House. U.S. Sen. Susan Collins is also considering a bid and may be able to scatter Republicans and Democrats. Mason has national connections: A lead engineer of Texas Sen. Ted Cruz’s Maine presidential caucus victory in 2016, Mason helped eventual Republican nominee Donald Trump organize a rally in Lisbon days before the election in which he beat Democrat Hillary Clinton. He’s socially conservative with a lifetime 93 percent score from the American Conservative Union and many supporters in Maine’s evangelical base, which lifted Cruz to the caucus victory and helped U.S. Rep. Bruce Poliquin win the nomination in Maine’s 2nd Congressional District in 2014. Mason would be the youngest governor ever elected in Maine history, according to the Maine Law and Legislative Library, beating Maine’s fifth governor, Albion Parris, by months. But David Dunn was acting governor for two days in 1844 at age 32.